There are three main theories of the Universe; Dualism, Monism and Nihilism. It is impossible to enter into a discussion of their relative merits in a popular manual of this sort. They may be studied in Erdmann's “History of Philosophy” and similar treatises. All are reconciled and unified in the theory which we shall now set forth. The basis of this Harmony is given in Crowley's “Berashith” — to which reference should be made. (There is also a particular Nature of Him, in certain conditions, such as have obtained since the Spring of 1904, e.v.) This profoundly mystical conception is based upon actual spiritual experience, but the trained reason4) can reach a reflection of this idea by the method of logical contradiction which ends in reason transcending itself. The reader should consult “The Soldier and the Hunchback” in Equinox I, I, and Konx Om Pax. “Unity” transcends “consciousness”. It is above all division. The Father of thought — the Word — is called Chaos — the dyad. The number Three, the Mother, is called Babalon. In connection with this the reader should study “The Temple of Solomon the King” in Equinox I, V, and Liber 418. Below this abyss we find the moral qualities of Man, of which there are six. The highest is symbolised by the number Four. Its nature is fatherly6); Mercy and Authority are the attributes of its dignity. Pendant to this sixfold system is the number Ten7) which includes the whole of Matter as we know it by the senses. It is impossible here to explain thoroughly the complete conception; for it cannot be too clearly understood that this is a “classification” of the Universe, that there is nothing which is not comprehended therein. The Article on the Qabalah in Vol. I, No. V of the Equinox is the best which has been written on the subject. It should be deeply studied, in connection with the Qabalistic Diagrams in Nos. II and III: “The Temple of Solomon the King”. All these numbers are of course parts of the magician himself considered as the microcosm. The microcosm is an exact image of the Macrocosm; the Great Work is the raising of the whole man in perfect balance to the power of Infinity. In this there is nothing peculiar. It is so with all scientific knowledge. A blind man might cram up astronomy for the purpose of passing examinations, but his knowledge would be almost entirely unrelated to his experience, and it would certainly not give him sight. A similar phenomenon is observed when a gentleman who has taken an “honours degree” in modern languages at Cambridge arrives in Paris, and is unable to order his dinner. To exclaim against the Master Therion is to act like a person who, observing this, should attack both the professors of French and the inhabitants of Paris, and perhaps go on to deny the existence of France. But discussions of the details of purely imaginary qualities are frivolous and may be deadly. For the great danger of this magical theory is that the student may mistake the alphabet for the things which the words represent. An excellent man of great intelligence, a learned Qabalist, once amazed the Master Therion by stating that the Tree of Life was the framework of the Universe. It was as if some one had seriously maintained that a cat was a creature constructed by placing the letters C. A. T. in that order. It is no wonder that Magick has excited the ridicule of the unintelligent, since even its educated students can be guilty of so gross a violation of the first principles of common sense.«Long since writing the above, an even grosser imbecility has been perpetrated. One who ought to have known better tried to improve the Tree of Life by turning the Serpent of Wisdom upside down! Yet he could not even make his scheme symmetrical: his little remaining good sense revolted at the supreme atrocities. Yet he succeeded in reducing the whole Magical Alphabet to nonsense, and shewing that he had never understood its real meaning. The absurdity of any such disturbance of the arrangement of the Paths is evident to any sober student from such examples as the following. Binah, the Supernal Understanding, is connected with Tiphereth, the Human Consciousness, by Zain, Gemini, the Oracles of the Gods, or the Intuition. That is, the attribution represents a psychological fact: to replace it by The Devil is either humour or plain idiocy. Again, the card “Fortitude”, Leo, balances Majesty and Mercy with Strength and Severity: what sense is there in putting “Death”, the Scorpion, in its stead? There are twenty other mistakes in the new wonderful illuminated-from-on-high attribution; the student can therefore be sure of twenty more laughs if he cares to study it.» A synopsis of the grades of the A∴ A∴ as illustrative of the Magical Hierarchy in Man is given in Appendix 2 “One Star in Sight.” This should be read before proceeding with the chapter. The subject is very difficult. To deal with it in full is entirely beyond the limits of this small treatise. But when we speak of dealing with the planets in Magick, the reference is usually not to the actual planets, but to parts of the earth which are of the nature attributed to these planets. Thus, when we say that Nakhiel is the “Intelligence” of the Sun, we do not mean that he lives in the Sun, but only that he has a certain rank and character; and although we can invoke him, we do not necessarily mean that he exists in the same sense of the word in which our butcher exists. When we “conjure Nakhiel to visible appearance,” it may be that our process resembles creation — or, rather imagination — more nearly than it does calling-forth. The aura of a man is called the “magical mirror of the universe”; and, so far as any one can tell, nothing exists outside of this mirror. It is at least convenient to represent the whole as if it were subjective. It leads to less confusion. And, as a man is a perfect microcosm,12) it is perfectly easy to re-model one's conception at any moment. Now there is a traditional correspondence, which modern experiment has shown to be fairly reliable. There is a certain natural connexion between certain letters, words, numbers, gestures, shapes, perfumes and so on, so that any idea or (as we might call it) “spirit”, may be composed or called forth by the use of those things which are harmonious with it, and express particular parts of its nature. These correspondences have been elaborately mapped in the Book 777 in a very convenient and compendious form. 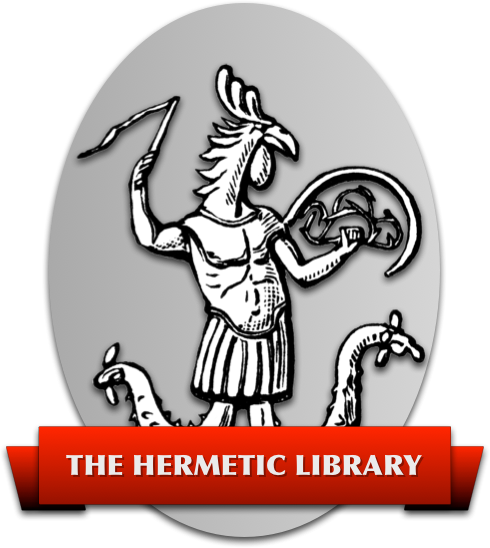 It will be necessary for the student to make a careful study of this book in connexion with some actual rituals of Magick, for example, that of the evocation of Taphtatharath printed in Equinox I, III, pages 170-190, where he will see exactly why these things are to be used. Of course, as the student advances in knowledge by experience he will find a progressive subtlety in the magical universe corresponding to his own; for let it be said yet again! not only is his aura a magical mirror of the universe, but the universe is a magical mirror of his aura. The knowledge of exoteric science is comically limited by the fact that we have no access, except in the most indirect way, to any other celestial body than our own. In the last few years, the semi-educated have got an idea that they know a great deal about the universe, and the principal ground for their fine opinion of themselves is usually the telephone or the airship. It is pitiful to read the bombastic twaddle about progress, which journalists and others, who wish to prevent men from thinking, put out for consumption. We know infinitesimally little of the material universe. Our detailed knowledge is so contemptibly minute, that it is hardly worth reference, save that our shame may spur us to increased endeavour. Such knowledge13) as we have got is of a very general and abstruse, of a philosophical and almost magical character. This consists principally of the conceptions of pure mathematics. It is, therefore, almost legitimate to say that pure mathematics is our link with the rest of the universe and with “God”. All advance in understanding demands the acquisition of a new point-of-view. Modern conceptions of Mathematics, Chemistry, and Physics are sheer paradox to the “plain man” who thinks of Matter as something that one can knock up against. Considerations of the Christian Trinity are of a nature suited only to Initiates of the IX Degree of O.T.O., as they enclose the final secret of all practical Magick. It is not possible to give a full account of the twenty-two “paths” in this condensed sketch. They should be studied in view of all their attributes in 777, but more especially that in which they are attributed to the planets, elements and signs, as also to the Tarot Trumps, while their position on the Tree itself and their position as links between the particular Sephiroth which they join is the final key to their understanding. It will be noticed that each chapter of this book is attributed to one of them. This was not intentional. The book was originally but a collection of haphazard dialogues between Fra. P. and Soror A.; but on arranging the MSS, they fell naturally and of necessity into this division. Conversely, my knowledge of the Schema pointed out to me numerous gaps in my original exposition; thanks to this, I have been able to make it a complete and systematic treatise. That is, when my laziness had been jogged by the criticisms and suggestions of various colleagues to whom I had submitted the early drafts. See “The Soldier and the Hunchback,” Equinox I, I. The apparatus of human reason is simply one particular system of coordinating impressions; its structure is determined by the course of the evolution of the species. It is no more absolute than the evolution of the species. It is no more absolute than the mechanism of our muscles is a complete type wherewith all other systems of transmitting Force must conform. He is this only by definition. The universe may contain an infinite variety of worlds inaccessible to human apprehension. Yet, for this very reason, they do not exist for the purposes of the argument. Man has, however, some instruments of knowledge; we may, therefore, define the Macrocosm as the totality of things possible to his perception. As evolution develops those instruments, the Macrocosm and the Microcosm extend; but they always maintain their mutual relation. Neither can possess any meaning except in terms of the other. Our “discoveries” are exactly as much of ourselves as they are of Nature. America and Electricity did, in a sense, exist before we were aware of them; but they are even now no more than incomplete ideas, expressed in symbolic terms of a series of relations between two sets of inscrutable phenomena. Knowledge is, moreover, an impossible conception. All propositions come ultimately back to “A is A”.